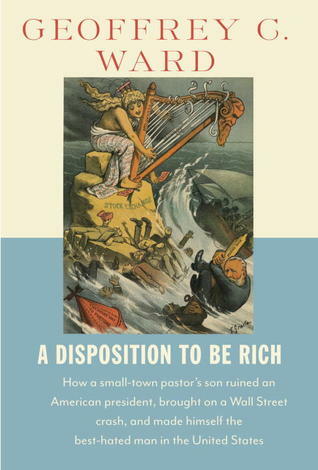 I just finished reading A Disposition to Be Rich: How a Small-Town Pastor’s Son Ruined an American President, Brought on a Wall Street Crash, and Made Himself the Best-Hated Man in the United States, a biography with lots of sin and no redemption, a tale sure to brighten a gloomy time of year. One the book’s blurbs refers to its subject as the Bernie Madoff of the 1880s. Ferdinand Ward became the self-proclaimed “best-hated man in America” when his house of financial ill-repute, Grant & Ward, collapsed in bankruptcy on May 6, 1884. Ward proved to be a swindler running a Ponzi scheme–bad enough. Worse, his partner was Ulysses S. Grant, Jr., whose illustrious father served as an unofficial front man for Ward’s machinations. The General invested his personal wealth and prestige in the firm. When it collapsed the former president had only $80.00 remaining in his wallet and a sore throat. Within weeks he learned that ache was cancer of the tongue and that he was dying. Along Wall Street Ward’s stock quickly fell from “Young Napoleon of Finance” to slithering scoundrel. Nationally, during the following months he became the man who killed General Grant. Ward bribed his way to a day pass from jail to stand incognito and observe Grant’s coffin processing to his tomb on the Hudson. 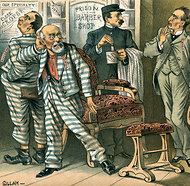 “The Prison Barber Shop” by B. Gillam, from Puck magazine, July 8, 1885. From a review of Ward’s book in the New York Times. During nine years in Sing Sing, Ward borrowed bribe money from relatives (whom he never repaid) distributing it to pliable prison officials who then plied him with better food, a cushier job, and a decorated cell. His Presbyterian preacher father and ultra-pious mother, former missionaries to India, swore their precious boy had never done anything wrong. After his time in prison, Ferd resumed his old trade of fleecing and living on the take. Once, he tried to kidnap his estranged son in a bid to grab his late wife’s inheritance away from the boy. When reproved or rebuffed, Ferd resorted to self-pity, scapegoating, blame shifting, outright lies, and threats of legal action. Ferdinand Ward reminded me of a skinny, mustachioed Tony Soprano; neither of them had been born with a conscience. I don’t know if I would be honored, amused, or ashamed to count Ferd as my great-grandfather. The book’s author, Geoffrey C. Ward, has no choice in the matter. He’s stuck with this bad apple hanging from the family tree. I suspect most historians are actually hunting for their ancestors. I know I am. I have studied Minnesota farm communities, because I lived in one. I have studied Dutch immigrants in New Jersey because I am descended from them. I am not related to any American presidents, but I study them anyway. I suspect it’s because I was a kid who always fancied himself to be presidential material. If memory serves, I would have been retired from the White House now, had I followed the personal timeline written inside one of my high school notebooks. My favorite HIST 152 assignment, bar none, is the research paper, an exercise in history from the bottom up. Instead of presidents getting the chapter headings, it might be grandma, the family farm, the bakery grandpa started, or a relative who had a near brush with historical fame. The point is for students to see how their personal histories have been touched by ‘big’ history, and how small stories make history. Sometimes these projects uncover intrigue in some ancestor’s life. One paper told of a great grandfather. According to family lore, the old follow had emigrated from Ireland to elude the police. His crime was belonging to the Irish Republican Army when the Brits still regarded the Emerald Isle as part of the United Kingdom. The family legend said that great-grandpa became a mule for the IRA, carrying funds from the United States back to Ireland to finance incidents aimed at ousting the British occupiers. The student could not find any letters or memoirs or diaries, or any other source that might nail the story down. But, he could prove two things: great-grandpa worked as a laborer in the rail yards (not a lucrative occupation in 1910) and on at least three or four occasions over the course of about six years he had travelled back to Ireland. How could a menial, manual laborer afford to do that? As a good historian should, the student hedged. But, the circumstantial evidence did point in the right direction. Great-grandpa was, indeed, a man of historical mystery. What that mystery exactly was, remained hidden—for now, at least. But, the family legend lives on. I don’t know if I should feel sorry for Geoffrey Ward’s ancestry, or envious that his great-grandfather left a book in the making in his wake. At least Geoffrey makes an honorable living, if being a historian can be honorable. I’d like to think so. I became one largely because of this piece of sage advice, “What could be better than being paid to read what you want to read?” I would add to that, what could be better than being paid to uncover who those ancestors really were, who I really am because of them, and then writing and teaching to shine any glimmers of light I find onto the traces of still more pasts sitting in a classroom or reading an article? What can you do with history major? Find out cool stuff about people and yourself. This entry was posted in Bob Schoone-Jongen and tagged A Disposition to Be Rich, ancestry, biography, book note, book review, Ferdinand Ward, Geoffrey C. Ward, history. Bookmark the permalink. Nicely said, Bob! Perhaps we need a blog on the scalawags in your own past. Growing up in the CRC in NJ? That’s two kinds of “mafia”! Lots of room for ne’re-do-wells there.